Several key recommendations from the Department of Justice COPS Office for Philadelphia Police reforms may be blocked from implementation by “contractual conflicts” with the Fraternal of Police, according to a “Reform Matrix” document created by the Police Department and obtained by The Declaration. 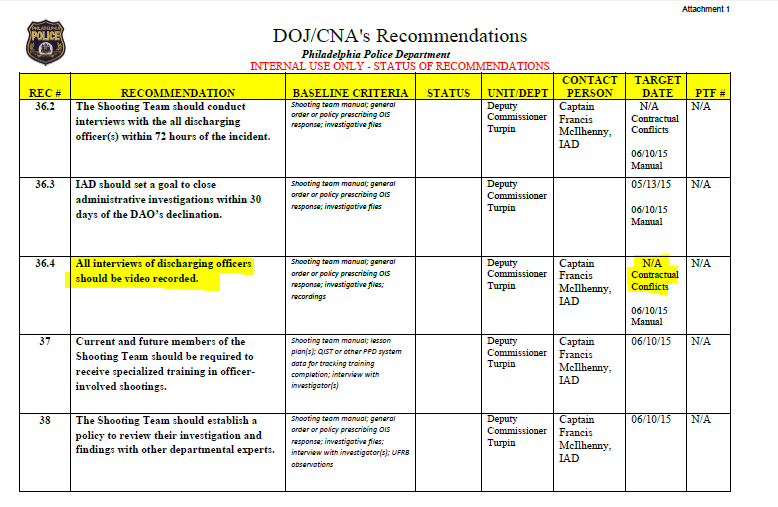 The Assessment of Deadly Force in the Philadelphia Police Department report, by George Fachner and Steven Carter for CNA Corporation, pairs the recommendations with findings about the department’s current practices. Each finding of a total of 48 include decimal point recommendations (e.g, Finding 1, Recommendations 1.1,1.2,1.3, etc). Joanne A. Epps, Dean of Temple University’s Beasley School of Law and recently-appointed chair of the mayor’s new Police Community Oversight Board (created specifically to oversee implementation of the DOJ reforms), emailed The Declaration that PCOB “has no public position on the matter” and that “ethics rules discourage me from speaking for the Board,” when reached for comment late last week. Another big step toward more accountability is missing from the Matrix, says Police Advisory Commission Executive Director and Civilian Oversight Board member Kelvyn Anderson. Anderson will play an active role in most stages of the proposed reform process, as both head of the City’s civilian police oversight body, and a member of Mayor Nutter’s oversight board appointed specifically for the purpose of implementing the DOJ recommendations. Multiple findings of the report deal with the PPD’s history of denying the PAC access to records it needs to review complaints filed with the Commission, for example number 46: The PPD does not fully accommodate the PAC in its role of providing independent civilian oversight of police operations in Philadelphia. Under the 47th finding, that “Distrust in the ability of the PPD to investigate itself pervades segments of the community…” and that “a lack of transparency in investigative outcomes help cement this distrust,” the report’s authors offered 3 recommendations. The second is another which points out the need for more access by the PAC to shooting investigations. Recommendation 47.2, “PPD should enter into an agreement with the Police Advisory Commission, allowing a PAC observer access to all pertinent documentation related to an OIS investigation,” was due for completion according to the target date of 5/27/15. Anderson says this is not the case. A Memorandum of Understanding is still being fine-tuned, he says, and lacks appropriate arrangements with the Internal Affairs Division as well as the Commissioner’s signature. Anderson also notes the absence of a timeline for ensuring immediate access to officer-involved-shooting scenes by a representative of the Police Advisory Commission. “Many of the questions that have come up around Brandon Tate-Brown, and the most recent shooting up in the 35th with the gentleman who was having a seizure,” might be better answered, and to the community’s satisfaction, says Anderson, if his Commission is allowed to perform its observer function. An emailed request for comment to the police department’s press spokesperson was not returned by publication. Embedded below is the reform matrix as provided to City Council in response to questions about the 2016 department budget, it is an early draft, from which some content has been removed in the online copy.